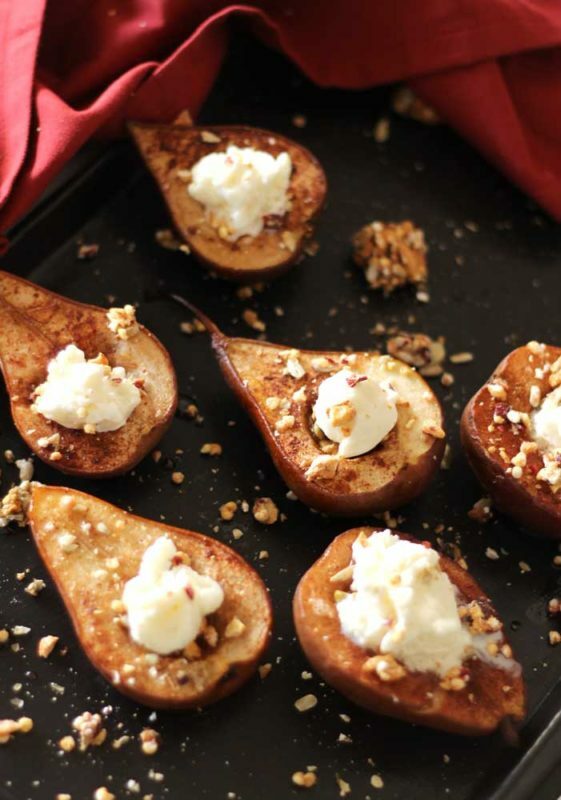 These Maple Vanilla Baked Pears are the perfect healthy sweet treat! Drizzled with warm maple syrup and cinnamon spice, these baked pears are topped with the perfect blend of crunchy cashew, cranberry and orange granola! This is a sponsored post written by me on behalf of Frontier Snacks. All opinions are entirely my own. Ahhh….the holiday months. I’m truly enjoying all the savory foods. Winter is the time when I get to enjoy yummy casseroles and warm, decadent desserts. But I’ve been craving a healthy sweet treat lately! One of my favorite sweet treats is Greek yogurt topped with granola, but I’ve wanted something new to eat with my granola. Finding a clean and gluten free granola is harder than you think! But when I found Frontier Bites made by Frontier Snacks, I fell in love! 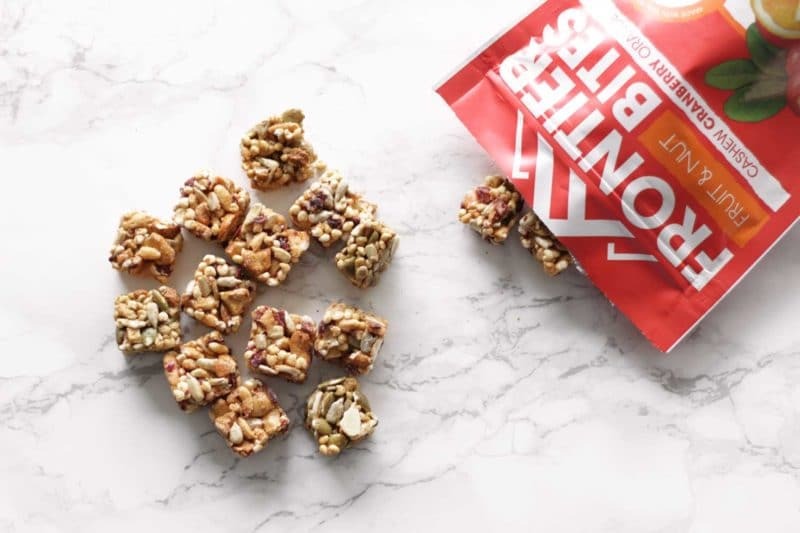 Their granola bites are so flavorful and the ingredients are so clean! Frontier Bites come in 5 flavor varieties and I LOVE them all!! There are a lot of things I love about Frontier Bites, but the thing I love the most is each variety only has 8 ingredients! You heard it right…8 INGREDIENTS! I love the story behind Frontier Snacks and how the owners got started. They were challenged to come up with the best alternative to the over-processed energy bars that they regularly ate. The rules they were given for this challenge were simple…they had to come up with something that had less than 10 ingredients and that was gluten, soy and dairy free. There could be no refined sugars and they could only use ingredients they could find in their pantry. And sure enough, they won the challenge and continued forward with their healthy Frontier Bites. You guys…I kid you not, this is the most flavorful granola I’ve ever had. You just can’t beat those flavor combinations! 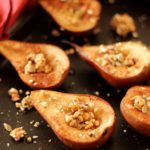 Over the holidays, I remember a friend of mine talking about these wonderful baked pears she made for a more natural and healthy snack option. I love pears, but I’ve never made baked pears before, so I decided to make a batch and oh my goodness, I’ve been missing out! These Maple Vanilla Baked Pears are divine and they scream flavor, especially when I added the Cashew Cranberry Orange Frontier Bites as a topper! This is the easiest snack recipe I’ve ever made and you only need 5 ingredients to make these Maple Vanilla Baked Pears! Who’s ready for the SIMPLEST recipe ever?!? Let’s walk through these easy steps. Wash your pears really well and cut each pear in half. Then you’ll spoon out the seeds in the middle. The next thing you’ll do is generously sprinkle ground cinnamon on each pear. The cinnamon will provide that warm spice taste when you take your first bite! Next, you will whisk the maple syrup with the vanilla extract and gently drizzle the syrup mixture over the pears. Your pears are now ready to bake! You’ll bake them in the oven for 30 minutes. Your pears will be tender and slightly roasted when you pull them out of the oven. Right as you take them out of the oven, you’ll then drizzle the remaining maple syrup and vanilla over the pears. The next step is to take a handful of your favorite variety of Frontier Bites and crumble them in your hands. Lightly sprinkle the granola onto each pear until the granola is lightly covering each pear. And that’s it! SIMPLE. EASY. HEALTHY. DELICIOUS! 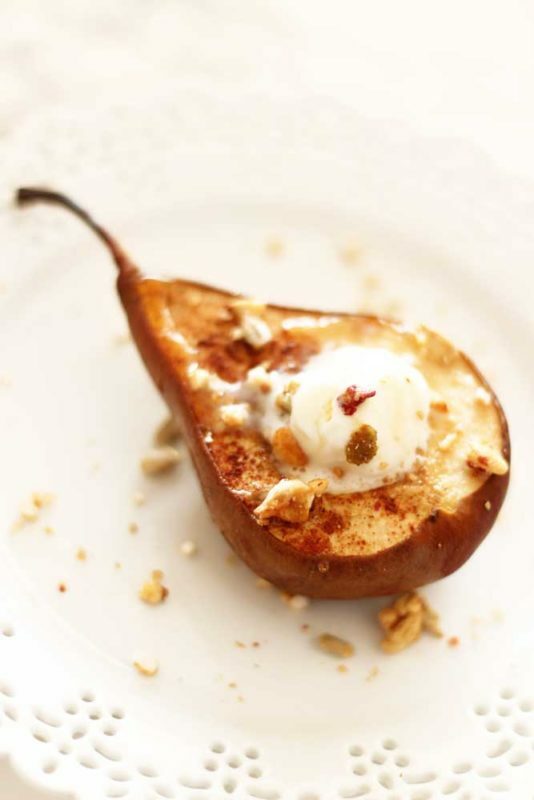 These Maple Vanilla Baked Pears with Granola really hit the spot and satisfied my sweet craving, but if want to add an extra kick of flavor, you can add vanilla ice cream on top of each pear! That will make for a fantastic dessert! 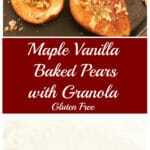 Or, if you want to keep it healthy, top each pear with a spoonful of Greek Yogurt and then sprinkle on the granola! You can’t go wrong either way! 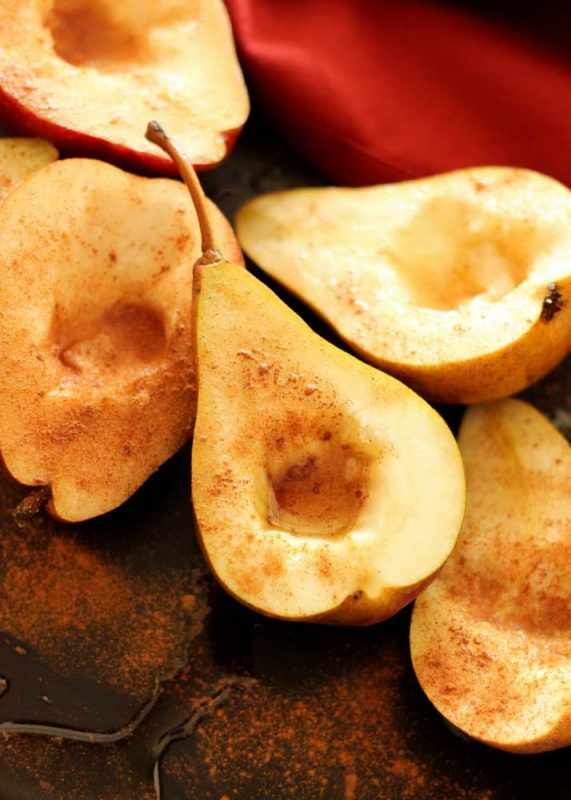 When making these Maple Vanilla Baked Pears, I use red Anjou pears. The Anjou pears tend to be more tender and are incredibly juicy. Another good trick is to cut a thin layer at the bottom of the pear so the pears will lay flat when you go to bake them on your cookie sheet or flexipan. 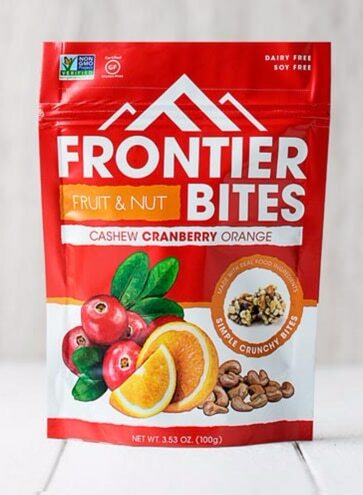 I chose to use the Cashew Cranberry Orange Frontier Bites flavor on my pears and oh my goodness, it was amazing! You can really taste the cranberry and orange flavors in every bite and it paired really well with the smooth warm pear. 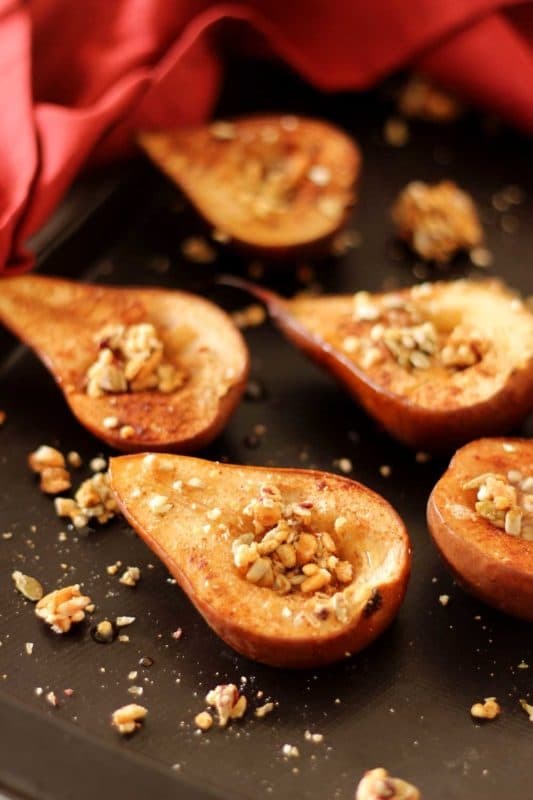 If you’ve tried these pears or any other recipe on the blog, then don’t forget to rate the recipe and let me know how it turned out in the comments below! I love hearing from you! Also – sign up for my newsletter and FOLLOW ME on FACEBOOK, TWITTER, INSTAGRAM and PINTEREST to see more delicious food I’m creating! 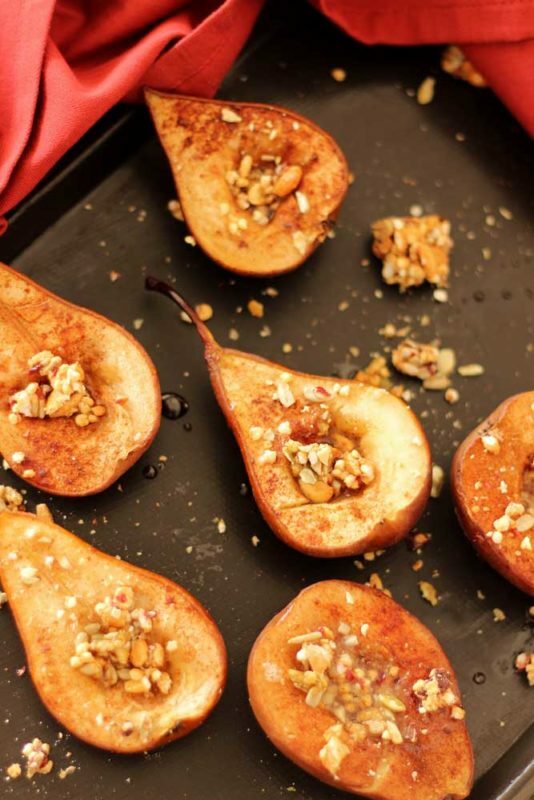 These Maple Vanilla Baked Pears are the perfect healthy sweet treat! Drizzles with warm maple syrup and cinnamon spice, these baked pears are topped with the perfect blend of crunchy cashew, cranberry and orange granola! Wash the pears well and slice them in half. You'll want to cut a small sliver off the bottom of each pear so they lie flat when placed on the cookie sheet or flexipan. With a sharp knife, remove the middle section of each pear and toss the seeds. Arrange each pear in a straight line on a cookie sheet lined with parchment paper. If you have a flexipan, you can use that to bake your pairs. 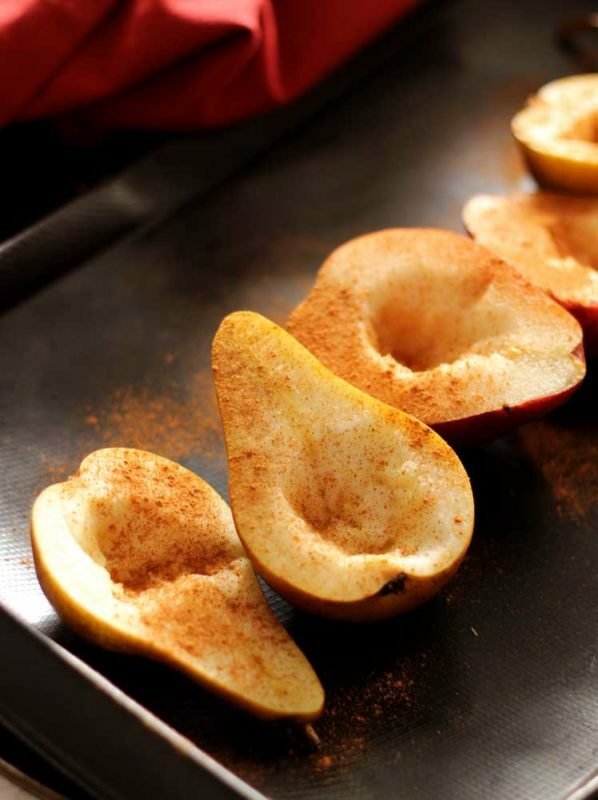 Sprinkle each pear evenly with ground cinnamon. In a small bowl, whisk together the maple syrup and vanilla extract. With a spoon drizzle half of the mixture over the pears. Set the remaining mixture aside. Place the pears in the oven and bake for 30 minutes. After 30 minutes, remove the pears from the oven and drizzle the remaining maple syrup mixture over the cooked pears. Next, take a handful of your favorite Frontier Bites and crumble them and sprinkle evenly on top of your baked pears. For an added taste, take a tablespoon of Vanilla Ice Cream or Vanilla Greek Yogurt and place in the middle of your pears. Sprinkle more crumbled granola on top. Store any uneaten pears in the refrigerator. Update Notes: This post was originally published in January 2017, but was re-published with updated step-by-step instructions, pictures and tips in December of 2018. What a nice & light dessert! Thanks! Enjoy! It’s super yummy! Haven’t posted my Instagram entry yet….my apologies. No worries! You can post daily until Feb 1 so definately enter daily! I see that your entries came through successfully so all looks good! Yum! I love the way pears smell when they are baking. Heaven! Oh my goodness my kitchen smelled so wonderful while they were baking….yes!! I just drew the winners for the raffles and I’ve sent emails out to the 2 winners! Check your emails and thanks for all who participated!